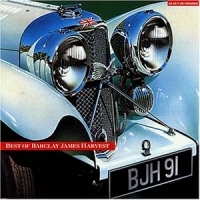 Barclay James Harvest is a group I'd heard of for decades but had never heard. Since they've been around in one form or another since 1966 I know for sure I came across their albums while thumbing through the LP stacks (back in the glory days when visiting a record store was a wonderful way to pass the time) but I swear I never heard a note from them on the radio or at a friend's house. It seems they have quite a following on the other side of the Atlantic Ocean and that explains their longevity but for whatever reason they failed to make much of an impression stateside. They wouldn't be the first band to suffer that fate, either. Nonetheless, I had these guys figured all wrong. And I mean wrong with a capital W. All this time I envisioned them as being some kind of semi-prog folk outfit that played an intricate brand of eclectic acoustic fare. My bad. I have no idea where I got that notion but when I finally got around to sampling their wares not long ago via this 'best of' collection I realized in a heartbeat that they didn't sound anything like what I expected. I kinda wish they would've because it might've been a more rewarding listening experience for me but they are what they are and I am what I am so be it. I will say this much, though. To call them prog, even as a crossover, is a stretch. I surmise that this assortment of tunes consisting of material they released between 1974 and 1992 should qualify me to make a fair assessment of what kind of musical entity they are. If not then they've got only themselves to blame. It does get off to a good start with 'Hymn.' The track's heavily stacked 12-string acoustic guitars got my attention instantly. I'm always attracted to simple songs that build up step by step and this one does that patiently and with class. Their sound on this number is very reminiscent of the Moody Blues but in this case they actually outdo that revered group. I can't tell if the lyrics are pro-Christian or sarcastic but at least they don't become condescending either way and I can appreciate that. 'Loving is Easy' follows and it belies a certain Alan Parsons Project flavor. It's not bad but it's definitely dated. 'Berlin' is next and a grand piano commands the intro, always a plus for me. All in all it's a pretty and very lushly orchestrated ballad that delivers the goods on schedule. I detect a palpable Supertramp vibe permeating 'Child of the Universe' and at this juncture I'm starting to discover why they never got on the US charts. All the bands other than BJH I've mentioned broke through over here before these guys did so it might be that the stuff the boys in BJH were setting out on the American table had already been fully indulged in and our appetite had been sated. Who wants a sirloin strip when you've just had a rib eye? Anywho, the tune makes nice use of a synthesizer and its overall depth of field is gratifying although the guitar ride is a little tepid and distracting. 'Victims of Circumstance' from the mid-80s is a highlight. Its large-scale aura sets up an engulfing moodiness that hovers over a strong groove. The delicate synth solo is graceful and I like the full vocals and chorale that distinguish the song. 'Poor Man's Moody Blues' is a bit of a head-scratcher. They erect a surprisingly accurate approximation of that heralded group's trademark sound complete with a massive Mellotron droning but I have to question their aim in going down that road. I don't really get it. It's an interesting homage, nevertheless. The only live cut comes in the form of one of their older hits, 'Mockingbird,' and it's an unmistakable specimen of what's known as 'lite rock.' It's not awful, mind you, but it's way too tame for my taste. No surprises happen and it's much too long to hold my attention. There's a noticeable New Wave gist running through 'Life is for Loving.' It's bouncy and upbeat pop presented without a single atom of prog so it's of no interest to me. 'Ring of Changes' is a step upwards due to its mysterious opening wherein various keyboards dominate. Its infectious melody is augmented by a cavernous aural backdrop and a memorable chorus. 'Titles' is another odd duck. It sports a Mott the Hoople-styled intro but then flat out exploits lines directly lifted from famous Beatle tunes to fill out the lyrics. It's a cool experiment, for sure, but, being a huge fan of the Fab Four, it feels like cheating in a way. The jury's out, in other words. But the verdict's in for 'Welcome to the Show.' It's nothing more than run-of-the-mill, straightforward pop rock that's blatantly formulaic and, thusly, a waste of a progger's time. Evidently I have the UK version of this record because the next cut, 'Stand Up,' is on it. It's a much more aggressive number because the strong drums are placed right up front. Since it hails from '92 it's safe to say that they'd most likely been listening to Tears for Fears when this was put together. I would've liked this song a lot if I'd heard it back then. 'Cheap the Bullet' rides atop a hard rock motif but it doesn't do much for me at all. 'Rock N Roll Star' does even less. It's an instantly forgettable pop fluff piece that displays no originality whatsoever. Lastly, 'Love on the Line' is some kind of amateurish techno pop extravaganza that I find uneventful and boring. I'm glad the CD ended when it did because it was going downhill fast. Is what I heard derivative? Yes, but that adjective isn't always derogatory. Recently I reviewed an album by Triumph that was so bad I gave it only a half-star rating. What was so appalling about it was their deliberate, shameless mimicking of popular bands of the 70s in what I took to be an attempt on their part to manufacture a hit single by osmosis. There's a big difference between copying a musical entity and honorably paying respect to them and Barclay James Harvest seems to be doing the latter. By retaining their own personality in the process they do preserve a modicum of dignity and pride that I can appreciate. At the same time the danger lies in taking it too far. Doing so prevents them from being unique and that deficit hampers them from standing out to a large extent, especially in the progressive rock arena where bold individualism is an indispensable trait. I can see why the prog powers that be put them in the same category as ELO, the Alan Parsons Project or even Styx but if so they belong in the 2nd class section of that boat due to their lack of imagination. 2.2 stars.